Bud Light’s 2014 Super Bowl commercial featuring Arnold Schwarzenegger, Don Cheadle, and a llama named Dolly made #UpforWhatever a trending hashtag. To capitalize on the initial campaign’s success and carry it through the summer, the beer brand and agency Mosaic transformed the town of Crested Butte, CO, into Whatever, USA, and invited 1,300 members of its target audience—adventurous, fun-loving 21- to 27-year-olds—to enjoy an event-packed weekend there in September 2014. “The whole concept didn’t exist until Super Bowl 2014,” notes Mosaic president Jeff Stelmach. 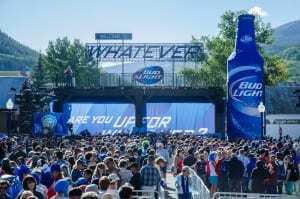 The original commercial and its ethos that, as Stelmach puts it, “the best times are unplanned” encouraged viewers to post their own #UpforWhatever videos; these, like the commercial itself, went viral. By the time Mosaic and Bud Light came up with the Whatever, USA concept to leverage that traction, they had just three months to implement it. To make sure the participants were truly up for Whatever as well, Mosaic had them “audition.” Consumers who signed up at the UpforWhatever.com website during the four-month campaign had to post videos or answer via live video chats quirky questions posed by the “mayor” of Whatever, USA. The contest was promoted on Facebook, Twitter, BuzzFeed, The Onion, and other websites as well as at myriad events nationwide, including the Electric Daisy Carnival Las Vegas and Lollapalooza. More than 200,000 people auditioned: “That shows a lot of hand raisers interested not only in the concept of Whatever, USA but also in the product,” Stelmach says. A number of the video auditions were posted on YouTube and Facebook. In keeping with the spontaneous vibe, the winners were notified at 10 p.m. local time the night before the weekend and flown out with their plus-one to Crested Butte—sorry, Whatever, USA—the following morning. From boarding passes to town streets to storefronts, every touch point was branded in keeping with the theme. The weekend itself, to quote website BroBible, “put Mardi Gras and Carnival to shame.” The 82 activities and performances included concerts on eight stages, a beer-and-baked-goods pairing session, and for the all-important element of surprise, unscheduled street encounters dubbed Stumble Upons. The volume and variety of events was key to distinguishing Whatever, USA from other experiential promotions, Stelmach says: “If 1,000 people showed up to one concert and all had the same experience, it wouldn’t have had the same impact.” For participants, being able to share the experience with their friends who weren’t there magnified their enjoyment. “The social currency of the experience is that they can share their stories,” Stelmach says. In fact, participants produced more than 37,000 pieces of user-generated content. To better enable attendees to post photos and videos online during the weekend, Mosaic brought in its own WiFi substations to boost the town’s normal capacity. The enhanced capacity also enabled participants to get the most out of the custom Whatever, USA app, which provided a schedule of events, alerted attendees to surprises such as Vanilla Ice’s Ice Cream Truck, and made it easy for them to connect with other participants. Mosaic and Bud Light produced 21 on-site videos during the weekend, which they shared not only via the app and the website but also on YouTube, Facebook, Instagram, and other platforms. Happily for Bud Light, all that sharing apparently made people thirsty. 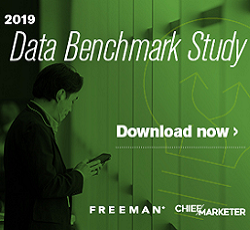 Reported past four weeks usage jumped 39% among those aware of the event compared with the control group of those unaware of the promotion. It’s no wonder the brand repeated the campaign in 2015.